Contractors participating in the QA New Homes Program are eligible to install systems in new home construction projects that intend to apply for the ENERGY STAR label. Builders: Click here to find an ENERGY STAR (QA New Homes) contractor. QA New Homes was launched in 2011 after the Environmental Protection Administration invited ACCA to lead the way in developing a contractor accreditation program for ENERGY STAR Certified Homes. The program supports ENERGY STAR efforts related to the installation of heating, ventilation, and air conditioning (HVAC) systems for newly constructed Certified Homes (v3.0). This only made sense, since ACCA is the author of the ANSI-approved standards for Quality Installation and Verification Protocols on which utilities, regulators, code officials, and contractors rely for quality assurance. Because ACCA is an organization of contractors who believe in the highest ethical standards, the QA Program was developed to be a rigorous program. Builders and regulators can rest assured that participants in the ACCA QA program are the most likely contractors to complete an actual quality installation. More than 700 contractors have qualified for the QA New Homes Program nationwide. 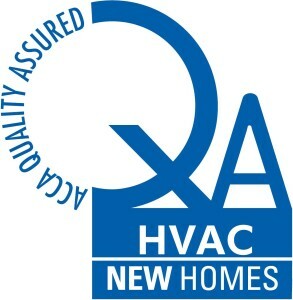 Participation in QA New Homes requires that a contractor meet several baseline requirements (including licensing and certification), follow ANSI-approved standards when designing and installing HVAC equipment, and maintain paperwork and documentation related to each installation intended for the ENERGY STAR label. ACCA verifies each participants’ licenses and credentials, and conducts random audits of all participants to ensure compliance. The QA application is a multi-step process. Click here to learn more and apply. Note: If your application is not accepted, your first year fee will be refunded.